This backyard practically begged for an overhaul. Back “yard” is being kind. In truth, it was simply a sea of blacktop, able to accommodate enough cars for a small shopping center. 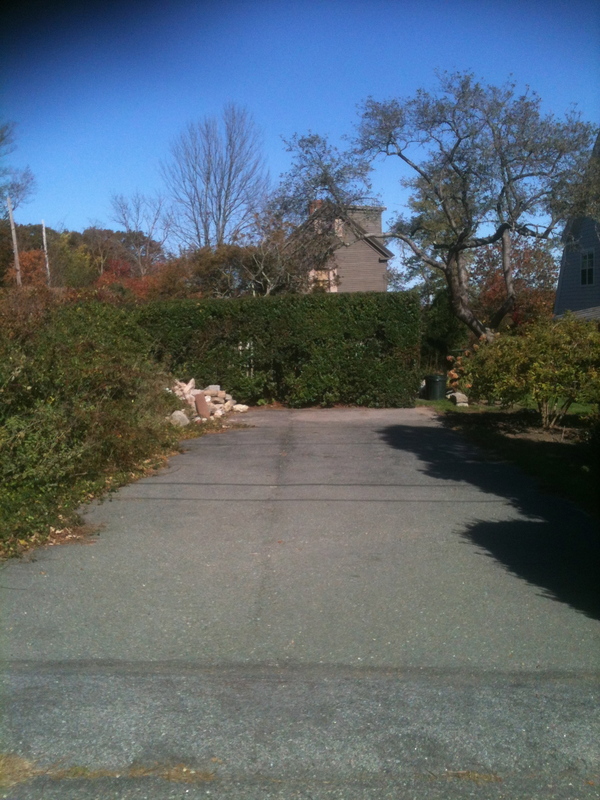 While the blacktop previously served as the driveway for the house, it has been replaced by a new gravel driveway at the other end of the property. The blacktop now mainly served as an eyesore and a conduit in heavy rains. 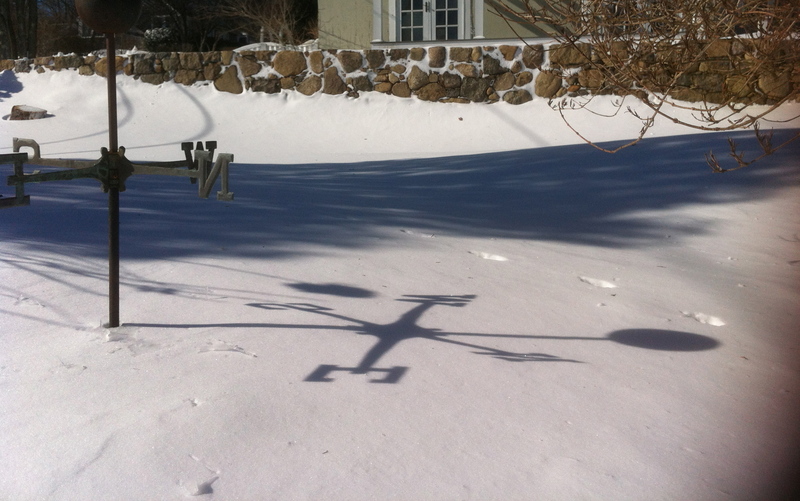 Indeed, water ran down the blacktop, pooled at the back door and then made a beeline toward the basement of the house. The blacktop had to go. Thus began a plan to replace it with a much softer garden retreat, with rooms for a potager, a sitting area, and a privet screened single car parking spot. The blacktop stretched up an incline to the property line. A rotted post and rail fence that divided the property from the uphill neighbor had disappeared under a jumble of overgrown mint, wild roses and morning glories that no longer bloomed. The roots of this tangled mess of vegetation were rapidly spreading and coming up into the gravel driveway and kitchen garden of the neighbor. A take-no-prisoners approach to all of this unchecked growth was the first order of the project. 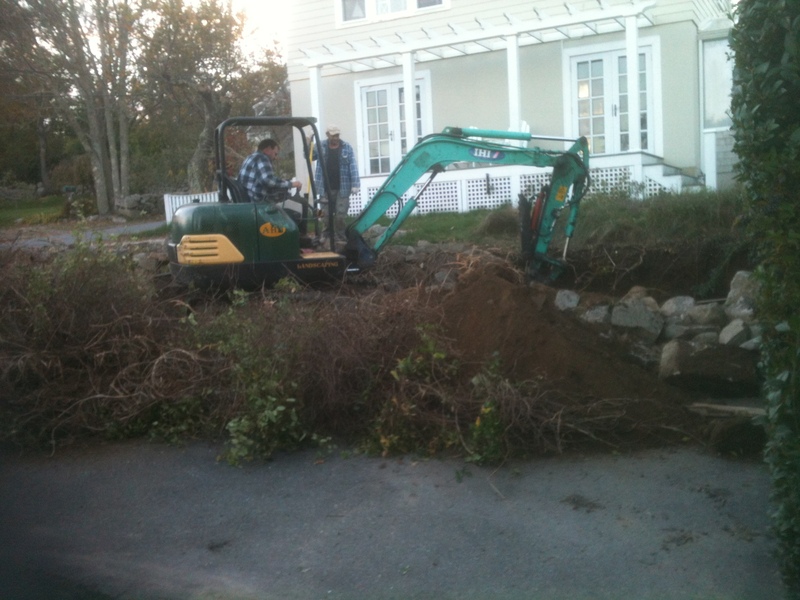 A backhoe clawed away the blacktop, the tangle of roots, the fence, and a low crumbling stone wall hidden underneath. A tabula rosa was now in place. Defining a garden space and giving it visual boundaries with stone or earth is known in garden parlance as “hardscaping.” A five-foot high and fifty-foot long wall constructed of stone does not get any more “hard.” The wall replaces the tangled miasma and runs the length of the planned garden space. The stone wall, which is more sculpture than wall, will give the new garden a visual reference, define the space, and impart an enveloping feel of privacy. The current plan (garden plans are always subject to change) is to have vegetables in beds below the wall and climbing hydrangea vines planted every ten feet running up and along the wall. The foliage will merge at the top of the wall in a seemingly connected cap running the fifty foot length. Separated from the vegetables by a short hedge will be a space for chairs and a table, for reading, light dining or just vacantly staring out at the ocean. A lot of patience and time are required for this plan, something in short supply from this writer. 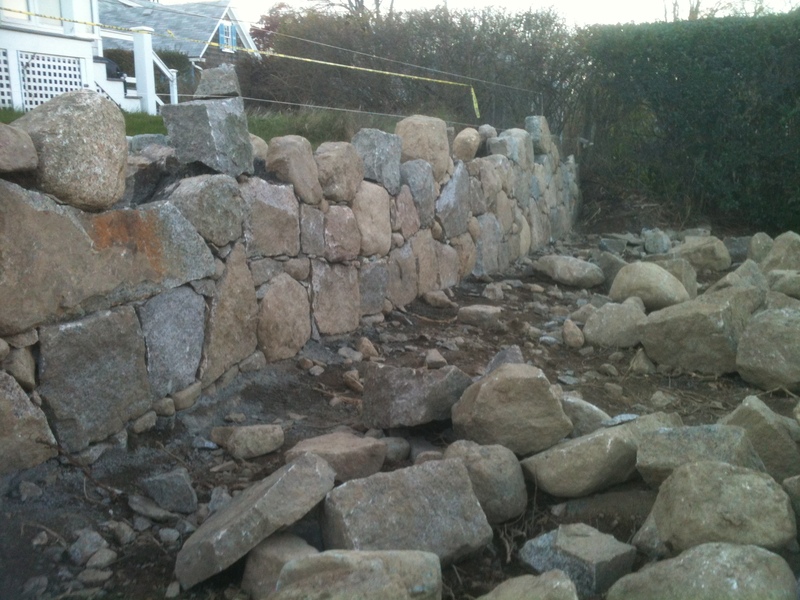 Dave McGibbon, stonemason, created the wall. He has the patience of Job as he eyes the stones for the wall and then places them by hand, some weighing several hundred pounds. When the wall is viewed from a distance the stones undulate and dip in sinuous lines creating a movement which carries the eye along its long length. 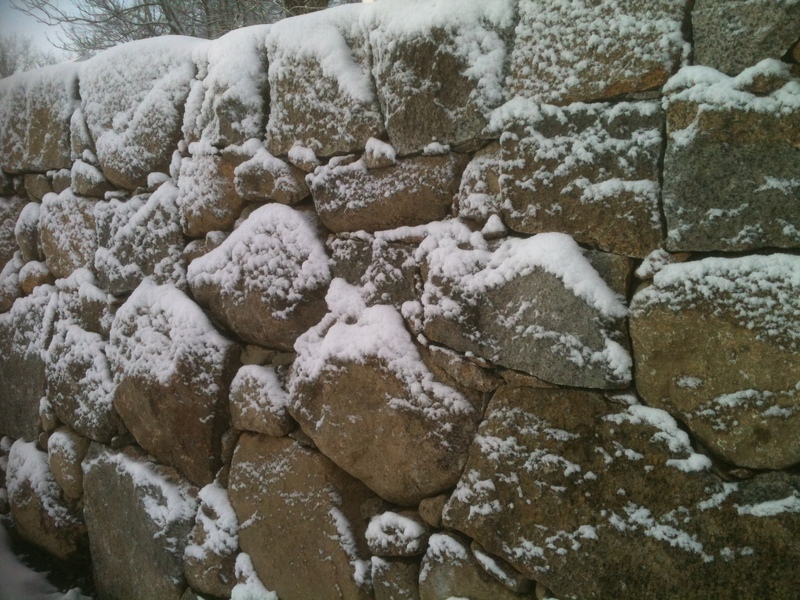 The outward appearance of this beautiful stone wall belies its inner structure. It has the outward appearance of a dry stone wall. The totally hidden cement block, rebar, and mortar within give it the strength it needs to support the neighbors higher level driveway on the uphill side. The garden spaces will expand the “walk around” space in the yard and allow the owners to stay busy in the summer. (As if more busy-ness is needed.) The stone wall frames the space and provides a destination for the eye from the lower yard. Rest assured, the loss of the strip mall sized parking lot will not be lamented.